Alien Invasion on Wrist to Forehead Sunday? I am in the midst of perfectly enjoyable Sunday afternoon of my anniversary weekend, and I pause to make a Sunday Cinema post, just so I don’t have to make two posts tomorrow. I don’t remember this scene in the movie. 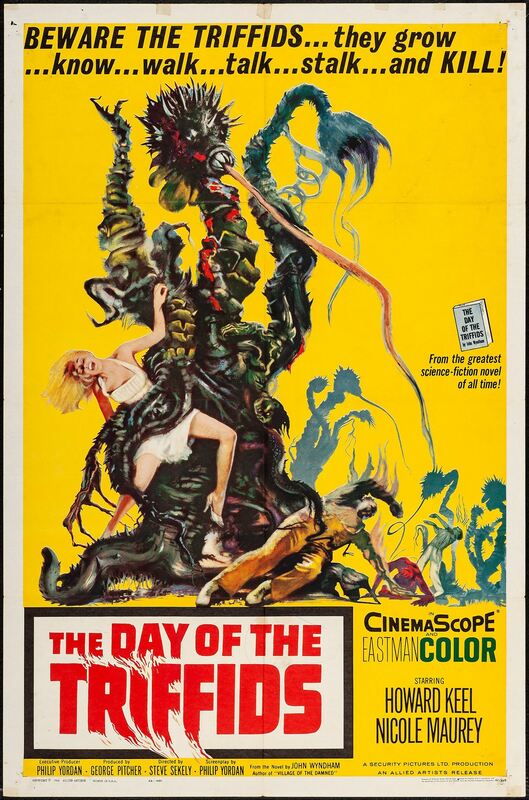 We began the movie watching portion of the day with Day of the Triffids (1962), which I just purchased on VHS at a rummage sale yesterday (Saturday). I saw the tail end of this movie many years ago and thought it was STUPID, laughed my head off at it, thought it was a cheesy movie and that was before I was particularly into cheesy movies. As it happens, the stuff leading up to the end is less than cheesy and pretty entertaining, although as with many movies of this era, it takes a while to get to the good stuff. 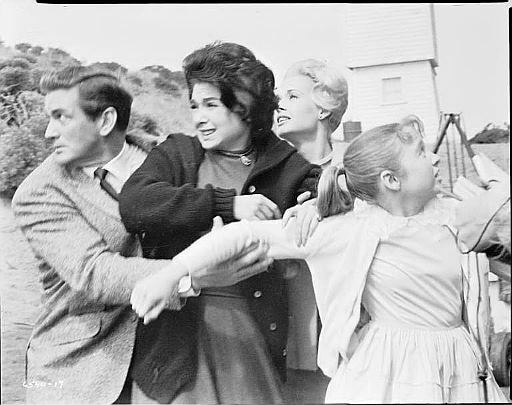 Check out Carolyn Jones, in the back with the blonde hair! 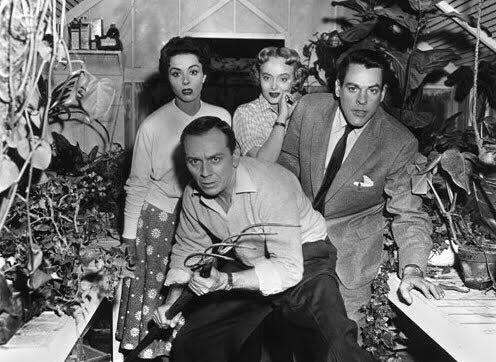 After Triffids, we went to Invasion of the Body Snatchers (1956), a different kind of alien invasion story. It is a bit serious, with the interesting philosophical question of whether it is better to feel and to love than otherwise. I don’t pay too much attention to such things during Sunday afternoon movie viewing. 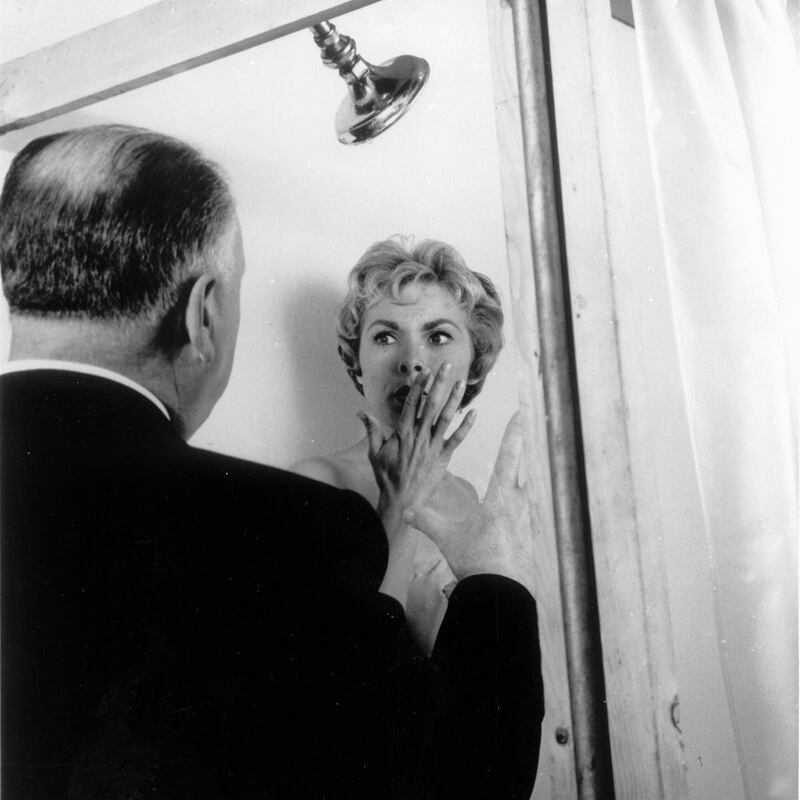 After Body Snatchers, Steven suggested The Birds (1963). The above was perhaps a publicity shot, although it may have been part of the party scene (don’t get your hopes up; it wasn’t that racy) (you know who you are). What Halloween movie will we pick next? A little suspense adds interest to my afternoon. In the meantime, I hope you are all having a lovely Sunday. Posted in humor, personal, Wrist to Forehead Sunday and tagged anniversary, blog post, blogging, cheesy horror movies, Day of the Triffids, entertainment, Invasion of the Body Snatchers, movies, The Birds. Bookmark the permalink. I am so tired of this heat!!! There, I complained. I have been all day on and off Facebook and have not, but now I did. And I have more blog followers than I have Facebook friends, which gives me no virtue for refraining to complain there only to complain here. So judge me if you are so inclined. Never mind that, I want to make a blog post, even if I feel too wrung out and mildewy to do so. Pretty much all I have done today is to watch movies, so how about a Non-Sequitur Thursday movie post? I’ll even include pictures. We began our movie watching with The Haunting, the 1963 original, not the pathetic remake. It is an excellent movie I have written about before, extremely scary using only sound effects, lighting, and acting. I’m thinking they don’t want chicken for dinner. We continued our movie watching with another movie from 1963, The Birds. It is a perennial favorite of ours. All that beauty, all that talent! 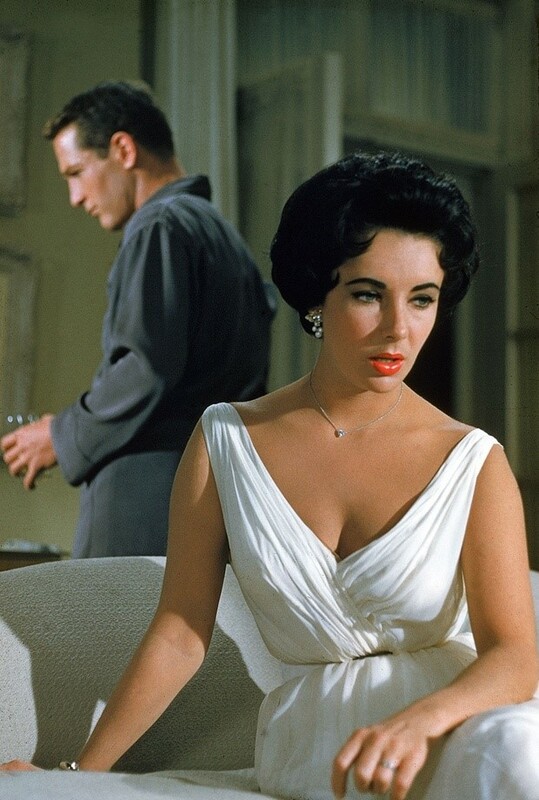 Next I suggested Cat on a Hot Tin Roof (1958), because it takes place where it is very very hot, so we could totally identify. Steven agreed that he could not object if I left him for Paul Newman. I feel the same way about him and Elizabeth Taylor, although we did not discuss that. There’s a Rogue’s Gallery, if you like. 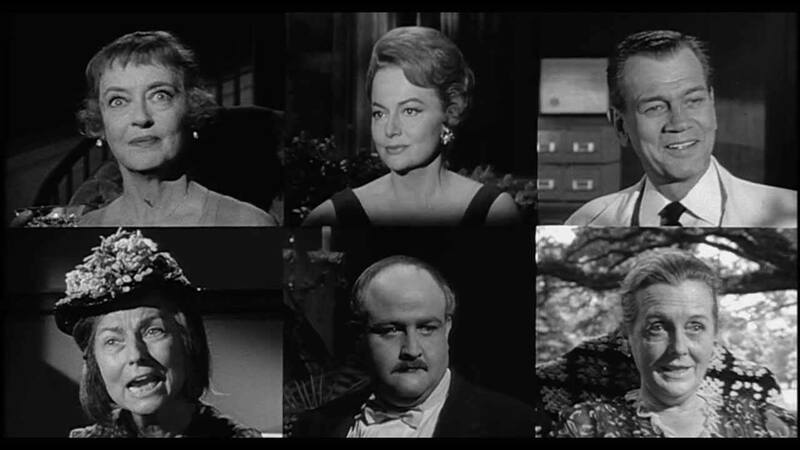 My next suggestion was Hush… Hush, Sweet Charlotte (1964), because it was another southern movie. Bette Davis, Cecil Kellaway, Agnes Moorehead, just to name our favorites! 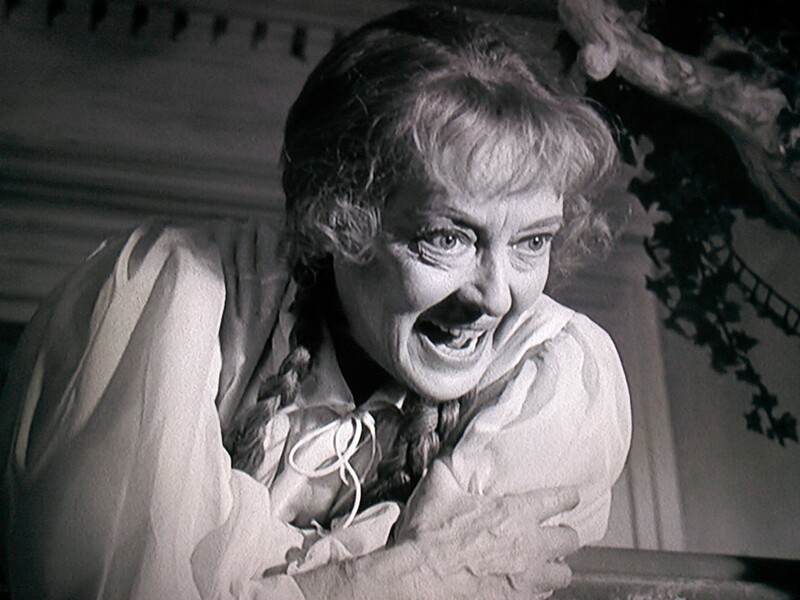 In fact, I think I will close with Bette Davis, in a shot I have used for my Facebook profile picture. I loves me some Bette Davis. 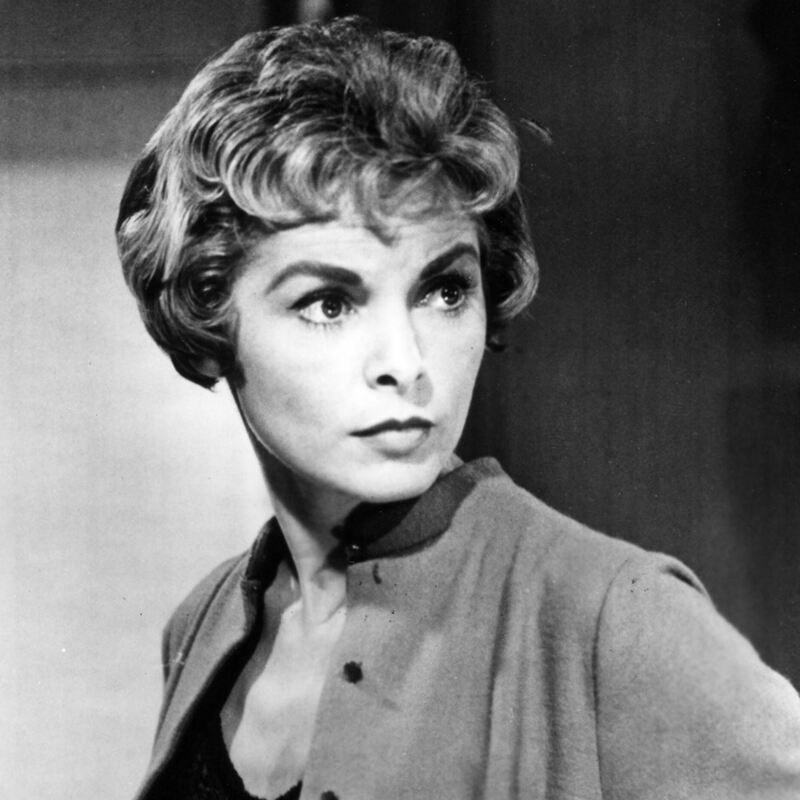 Posted in humor, Non Sequitur Thursday, personal, Uncategorized and tagged Cat on a Hot Tin Roof, heat, hush hush sweet charlotte, movies, The Birds, The Haunting. Bookmark the permalink. My bad blogging but good movie-watching week continues with a fast Non-Sequitur Thursday post. 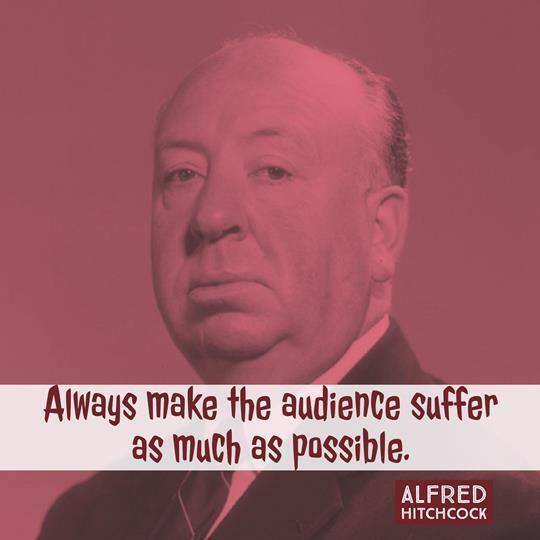 I am into Alfred Hitchcock today. I offered Steven a choice of The Birds or Psycho, and he chose The Birds. Murder and mayhem without being too disturbing. And we get to make fun of Annie the doormat. It is rather unbecoming of me, come to think about it, because I have sometimes acted the doormat myself, in my sordid, low-self-esteemed past. I try to avoid such behavior these days, but you just never now what you might do given the right (or wrong) circumstances. Not the party they were hoping for. This was the only photo I could find quickly featuring Annie the doormat. I can’t think of anything witty to say about Rod Taylor or Veronica Cartwright, so I will merely note their presence. 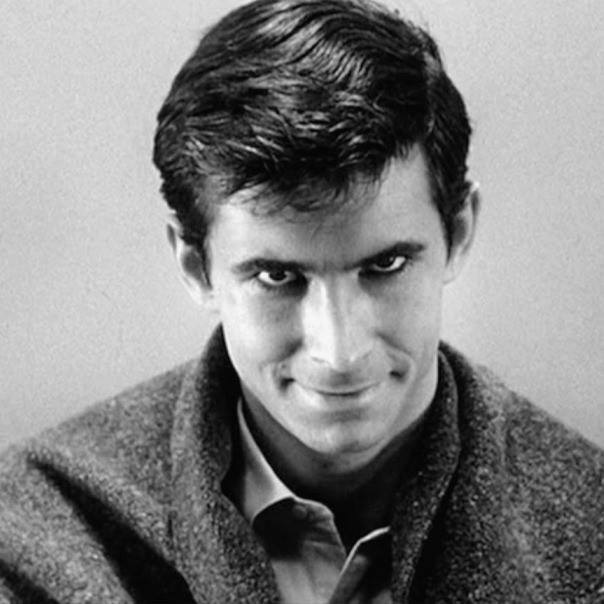 Maybe I can talk Steven into watching Psycho next. It starts slow then picks up and become quite satisfyingly creepy. In the meantime, I am missing The Birds while I type in this blog post. Full disclosure: I think I am coming down with a stupid cold. I hope I am feeling better tomorrow. Perhaps I could forgo Lame Post Friday and write a good post, to make up for my bad blogging week. No promises. Happy Thursday, though. Posted in humor, Non Sequitur Thursday, personal and tagged Alfred Hitchcock, bad blogging week, blog post, bloggers sick day, entertainment, movies, psycho, The Birds. Bookmark the permalink. I interrupt the movie-watching portion of the evening to make my Wrist to Forehead Sunday post. When I point out that it is also the bra off, sweats on, wine drinking portion of the day, I’m sure many will appreciate my dedication to making my blog post. Or perhaps you will merely snort and say, “Huh. Should have done that sooner.” I can’t worry about such negative people. I have a blog post to make. These are not the scariest stairs in the house, but they are the ones that include the most cast members. 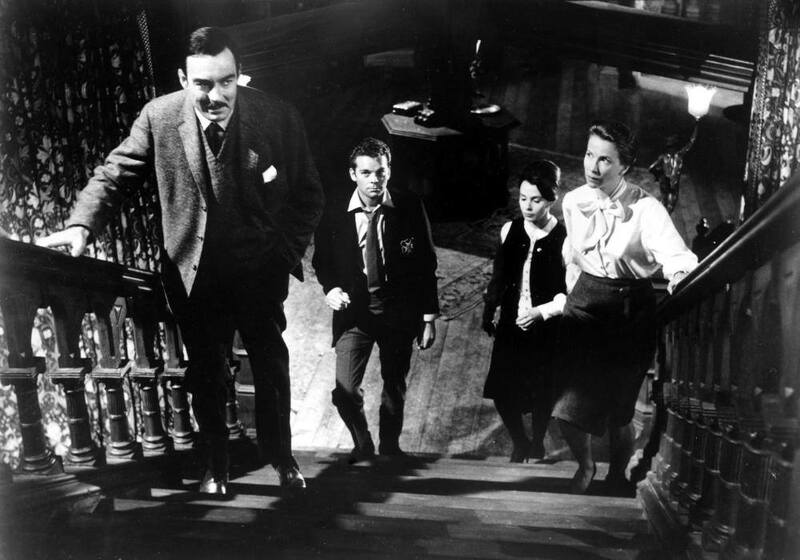 The first movie we watched today was The Haunting (1963), starring Julie Harris. It was directed by Robert Wise, whose birthday it is today, according to what I read on Facebook. I was happy to watch it in honor of the birthday, but in fact I have had it in mind to watch the classic for some time now. For one reason, it has popped up in a couple of my monster movie groups. For another reason, it is the Halloween season, and this is a classic ghost movie. Of course I am more apt to write about movies of the cheesy variety, but my tastes are not so vitiated that I scorn a true classic. I did not have the best time at my own prom, but at least I had it better than this chick. Steven suggested we watch Carrie (1976) next. That is another classic scary movie, but I am not sure I am in the proper mood for it. However, I remembered I had used this picture in a previous post, so thought I could recycle same. The movie I had in mind was The Birds (1963), because it is also Angela Cartwright’s birthday today. 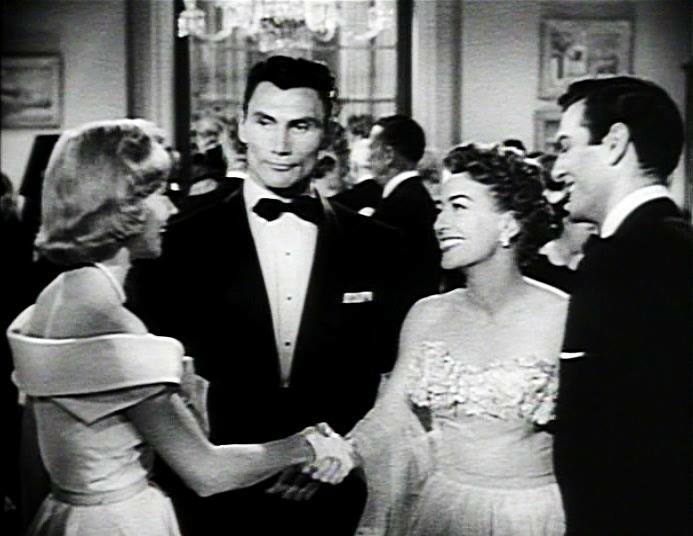 She is the rather pathetic younger sister of the love interest, Rod Taylor. I get her mixed up with her sister, Veronica, but Steven is usually able to set me straight. While I just spent an inordinate amount of time searching for a picture of Angela Cartwright in the The Birds that I could download, Steven popped in Carrie. Like I said, I don’t mind watching Carrie. I don’t mind watching almost any movie on Wrist to Forehead Sunday. But I sure would like another glass of wine. 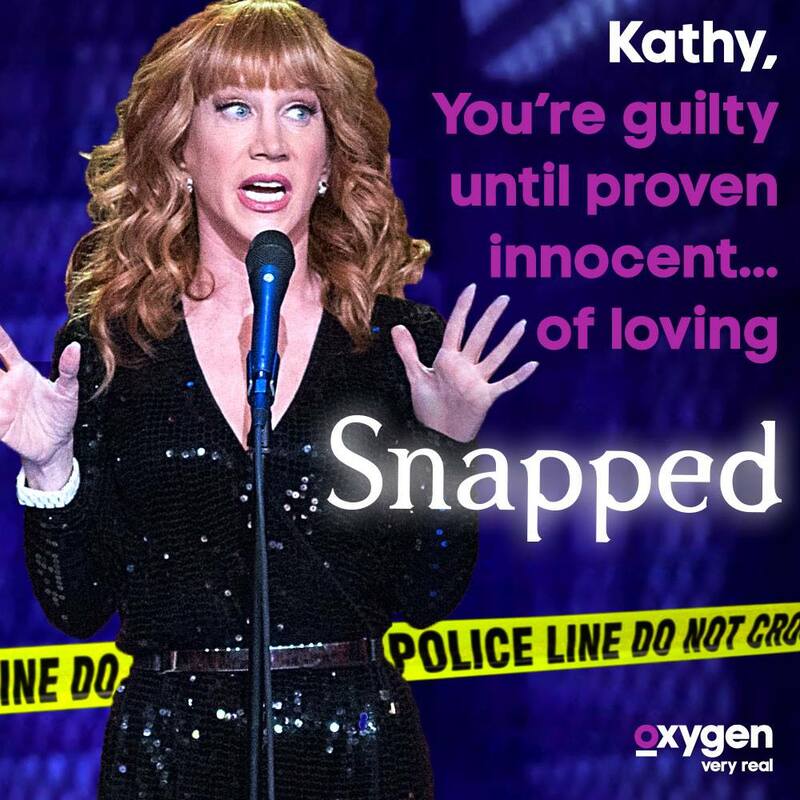 Posted in humor, personal, Wrist to Forehead Sunday and tagged Angela Cartwright, blog post, Carrie, entertainment, Halloween, monster movies, movies, photos, The Birds, The Haunting, wine, wrist to forehead. Bookmark the permalink. 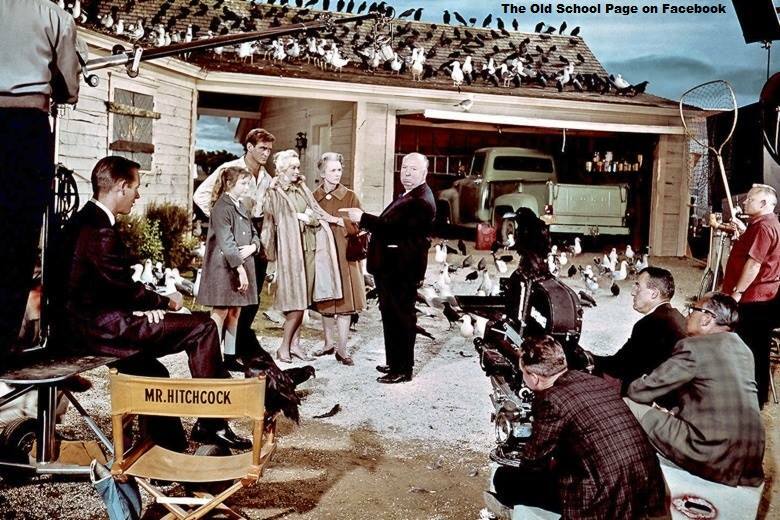 It is Alfred Hitchcock’s birthday, August 13. Steven and I had hoped to watch an Alfred Hitchcock movie when we got home tonight, but it seems that will not work out. Is it a Wrist to Forehead Sunday? I fear so. Never mind why; explanations are tiresome. We won’t worry about that but concentrate on the famous director’s birthday. I’m thinking this is only true in a sense. I picked this picture of him to share, because I liked the saying on it. This is not a rule I follow when I am directing or acting on a stage, by the way. 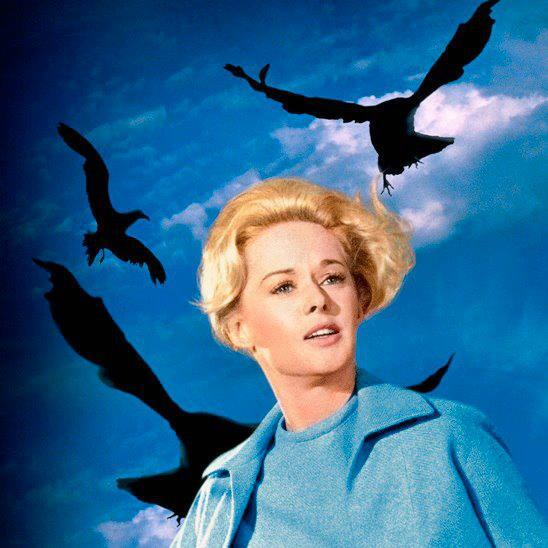 The Birds is one of our go-to movies, especially on a Sunday night. 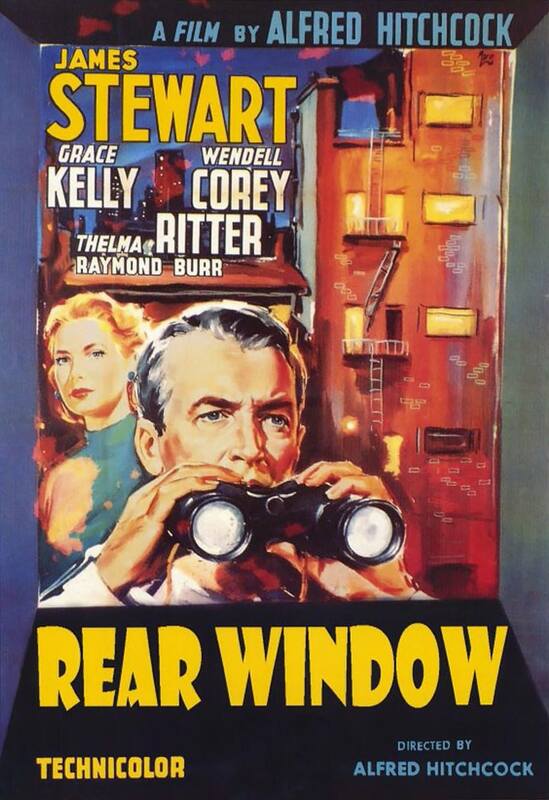 Rear Window, however, is arguably our favorite Hitchcock movie. The casting, the acting, the script, everything combines to make an entertaining whole. I say “arguably,” because there is also my beloved Rope. However, I cannot find any photos of Rope, so we won’t talk about that movie right now. We won’t talk about anything much, as it turns out. It is SO Wrist to Forehead Sunday. Happy Birthday, Alfred Hitchcock. Blog readers, please bear with me. I will try to come up with something better on Middle-aged Musings Monday. Posted in humor, personal, Wrist to Forehead Sunday and tagged Alfred Hitchcock, blog post, entertainment, movies, Rear Window, Rope, The Birds, wrist to forehead. Bookmark the permalink.